The star sky fascinates me since the childhood and youth. Mine of technology and nature eager grandfather Fritz (*1906, +1978), a qualified chapel master and violinist, showed me in his garden by a Zeiss binocular and a refractor (Kosmos E 68 f/13,2 with an equatorial mount) the 'miracles of the firmaments'. Thus I already got to know as a child the moon littered from impact craters, the phases of the Venus, the Jupiter and his moons, the rings of the Saturn, the Andromeda galaxy, the Orion nebula, the Pleiades and the double star clusters in the Perseus constellation. In recollection has also remained to me the first moon-landing on the 21st of July, 1969 which I might experience as a 6 year-old boy together with my grandfather in the early morning hours of this day in the television as a live broadcasting. In 1975 my grandfather gave me a small telescope (Kosmos refractor LW 50 with Lichtenknecker optics) which I use - mounted on a photo tripod - diligently. 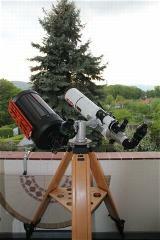 A 60 mm (2 inch) refractor of the Japanese company Tasco 14T on a small equatorial mount, however, with a good optic followed two years later as a present of my parents. Unfortunately, these both telescopes and also the optics of my grandfather have not been preserved in my possession. About my grandfather I got to know the count Henning von Stosch (*1897, +1982). He was a member of an old nobility family and pursued beside genealogy also astronomy. 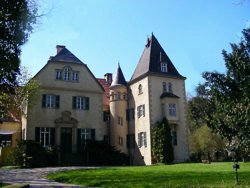 Since 1935 count Henning and his family lived on the 1455 first mentioned small castle Haus Ruhr near Westhofen (city of Schwerte, district of Unna, North-Rhine Westphalia), today seat of the Ruhr Academy. On my journey to the school in Schwerte I went past by the bus and the bicycle daily there. In summer 1976 count Henning showed me his observatory which he had accommodated in a tower of his castle. To my recordings it concerned older, but rather imposing 150 mm (6 inch) refractor of Carl Zeiss (Jena) with a focal length of about 2200 mm on a motorised equatorial mount. During the following years I was staying many times in this private observatory to accompany count Henning (he was very much competent in astronomy) on his nightly excursions to the stars. Many unforgettable looks at galaxies and star clusters as well as on the planets Mars, Jupiter and Saturn have stamped themselves on me and found entrance in my observation book. Count Henning also owned an extensive slide collection of astronomical objects which he brought forward with pleasure and commented. The quite rather old count and his family left the old castle in 1979. He had become close to his Haus Ruhr of highway A 45 too loud. The small castle was sold - what became to the nice Stosch'sche observatory at Haus Ruhr, I could not bring till this day, unfortunately, in experience. By education, study and occupation fell behind the practical 'Sternenguckerei' during the following years. In spite of membership in the Astro AG in the school my marks were too bad in physics and mathematics to begin a promising study of the Astrophysics. Then, however, the study of Archeology and History as well as a number of other (beside) fields offered me an as interesting like professional alternative. But the interest on astronomy still did not decrease. It was kept up by binoculars, magazines (Sterne und Weltraum, Sky & Telescope), visits in observatories and plantetariums, and many books. Finally, in autumn 2004 the wish got out of control to own again a telescope. At first the telescopes, eyepieces and the accessories from lacking experience and missing orientation changed in rapid succession. I learn the hard way but probably every rebeginner and novice of the amateur astronomy pays this premium. After some years of the experiments and comparisons a state which comes close to my ideas and wishes was reached. In the planning is currently a ATM project of a Newton telescope with a mirror of 18" or 20" (450 / 500 mm) as a 'Lowrider Dobsonian'. In my actual equipment the legendary C8 Schmidt's Cassegrain telescope of the US-American company Celestron may not be absent. The adverts for the C8 on the back cover of the magazine Sky & Telescope were well known to me as a keen reader. On the back cover of the December issue in 1982 no less than Lenoard Nimoy, the actor of the science officer Mr. Spock on the USS Enterprise, made a tribute to the C8 and to the cult status of the Science Fiction epic Star Trek. Fortunately, I have found with Stephanie already in the study time a partner who divides my passion(s) for many years without reservation and supports. The observations of the comets Hale -Bopp (spring, 1997) and 17P/Holmes (autumn, 2007) as well as many Shooting Stars and Deep Sky nights are unforgotten. Their both favourite objects in the solar system, the planets Jupiter and Saturn, were observed also intensely. As a member in the Vereinigung der Sternfreunde I am fellow in the professional groups 'Deep Sky' as well as 'History of the Astronomy'. The Kosmos-E 68 telescope had a 68 mm lens (probably from Lichtenknecker) and a focal length of 900 mm. It is in Rudolf Brandt: Das Fernrohr des Sternfreundes, Stuttgart 1953 described in detail. I have the 2nd edition of the book from 1962 with comments of my grandfather. He had probably set by the company in Stuttgart Wachter made mount on a wooden tripod and attached a homemade dew shield on the lens. The optical tube alone cost around 1960 as a new unit around 400 DM (German Mark). Because the telescope mount and the telescope already showed signs of wear and repair work, I suspect that my grandfather had bought it used. Rudolf Brandt, moreover, had also wrote the book "Himmelswunder im Fernglas" (Miracles in the sky binoculars), which also left handed in the papers of my grandfather as 3rd edition (Leipzig 1952). In my property are some books, magazines, logs and an observation book kept irregularly between 1976 and 1979 which contains entries, remarks and single drawings of objects. Stosch, Henning von: Genealogie des uradeligen schlesischen Geschlechts der Grafen von Stosch, o. O. 1927.. Biographical information about count Henning is not possible to me currently. His older brother Günther was a leader of the Gestapo in the governmental district Münster (in 1933-1935) and chief burgomaster of the city of Bottrop (in 1935-1941) as well as head of the provincial government in Münster (in 1941-1943) and Minden (in 1943-1945). For the history of house Ruhr look at Krüger, Kristina: Haus Ruhr, in: Burgen AufRuhr! Unterwegs zu über 100 Burgen, Schlössern und Herrensitzen in der Ruhrregion, Essen 2010, S. 367-370. The telescope and its mount were probably listed in the Zeiss catalogue from about 1920 and were described as a 6 inch refractor with a focal length of 2250 mm, ref. Carl Zeiss, Jena: Astronomical instruments. Catalogue No. 30, ed. by the Department for Astronomical Instruments, n.p. [Jena, about 1920], page 30-31 (PDF download 23.5 mb).